My Mom used to say that all the time. Once a Marine, Always a Marine. Mom was a Woman Marine through and through. It was in her blood. It is in my blood. Once when we took her to the horse races in her later years, she excused herself to find the ladies’ room. After a much too long time had elapsed and no sign of her return, I set out to find her, thinking she had just gotten lost on her way back from the restroom. Mom was not anywhere. I decided to head back to our seats thinking I must have missed her, but I was beginning to panic. The elevator doors opened and relief swept over me as my Mother stepped off, looking as beautiful and proud and classy at 75 as she must have looked as that 23 year old Woman Marine. To my amazement, when I asked where she had been, she actually beamed with her reply, “Why, I have been upstairs with the Women Marines!” It turns out they were having a regional meet at the racetrack. A whole room full of WWII Women Marines! Coincidence? Not on your life. Divine planning, it was long one of my Mother’s dearest wishes, to meet up with them again. She died two years later. Anyway, here is a newsclip from the vault. (Thanks to my cousin for sending it to me.) 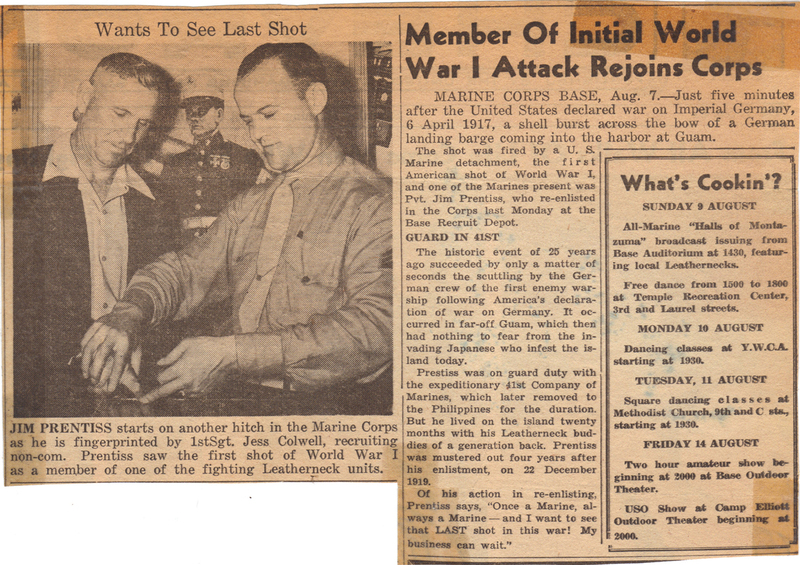 WWII had just broke out and Mom’s Dad, Grandpa, went back in the Corps. He was present in WWI for the first shot fired, and wanted to be there for the last shot of WWII. Later my Mom and her brother joined, Grandma’s whole freakin’ family! There is strength in my blood, too, I guess.